I follow the Flyers and Sixers, but really only when they’re into the playoffs. The Phils – that’s different. As a kid, I spent many a hot Sunday afternoon lying on the sofa being lulled asleep by the dulcet drone of By Saam, uninterrupted by any achievements that might resemble professional baseball. Whitey, Harry and Bill Campbell always made the Phigtins worth phollowing, even when they weren’t worth investing much of your time or money. But 1980 and 2008 made sticking with them through all their struggles worth every second of endless devotion. My Dad nearly had a coronary listening to the radio as Concrete Charlie sat on Jim Taylor to seal the 1960 Eagles’ NFL championship. And I stood for hours at Dilworth Plaza this year, waiting with my son and grandson for those green-clad buses to go by. It was a long time coming in more ways than one, but my aching flat feet never felt better. With all that Philly sports history behind me, nothing, absolutely nothing compares with my relationship with Philadelphia Union. You see, I never played that conspicuously American sport of “Armored Rugby,” and I flamed out early after Little League. But Footy? That’s something I actually know a thing or two about, and not just as a Founding (and still) STH. Right now it’s a love/hate relationship, with the balance tipping negatively. Because when you see lack of skill or execution at the pro level; when you see miscommunication and lack of tactical awareness; when you see clueless, hidebound adherence to strategies that simply don’t work with the pieces you have; and when you see an apparent inability to improve the product on the field from one week or month or year to another – it’s enough to make any footy aficionado’s blood boil. And it makes you question why you devote your gas money, tolls, parking fees, ticket fees, merch and even more precious time to such dreary spectacle. Yet, there are good reasons after all. Tailgating with family for one. But a recent article in The Atlantic cites a number of scientific studies that explain the fandom phenomenon. For instance, male fans of a winning team tend to experience an increase in testosterone, so maybe we’re all just jonesin’ for that natural steroid rush. Other studies show that being a fan can ward off depression and alienation, building a sense of belonging and self-worth. According to the studies, much of this good feeling is due to social bonds among fans — think high-fiving complete strangers after a goal. (While I enjoy the high fives, I’ve never really understood the motivation. I didn’t do anything other than buy a ticket, but I get to share credit for the Doop?) Supposedly, sports worship can even help fans deal with life’s emotional challenges, even when you just KNOW what’s going to happen in Toronto. Is it BIRG or BIRF? Still more studies have identified what amount to emotional syndromes like “Basking In Reflected Glory” (BIRG), “Cutting Off Reflected Success” (CORSING), “Cutting Off Future Failure” (COFFING), and the Union Fan-Favorite: “Basking In Reflected Failure” (BIRF). I have to admit that I’ve BIRFED more than once after late goals against the Boys in Blue. Regardless of how devoted a fan you may be, research has found that there are health risks associated with being a relentlessly devoted fan. Following a loss, we’re even more likely than usual to smother our success-drive with unhealthy food. And when those long hoped-for three points evaporate to nothingness, we’re more likely to be unproductive at work. For the sake of my Body Mass Index and my job security, for Footy’s sake, start finding a way to win. The junk food and antidepressants aren’t working anymore. This is important, scientific work here, Matt. Good job. I could probably track my alcohol spending and correlate it to Union successes and failure. (Union losing streak = extra bottle of bourbon for the month). 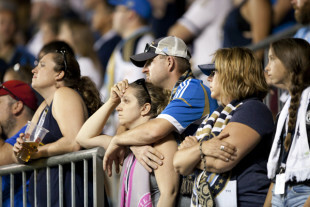 The big question is at what point do we need to go to Union Fan Rehab? Coming soon in 2018… union fan rehabilitation clinic!!! Union Fan Rehab Clinic… across the jaywalked street from Cynicism Corner near Unpaved Paradise… where Victory on tap is still not served. There are so many things I’ve cut out of my life in the pursuit of happiness. Any rational analysis of what’s left would include this team as the next to go. And yet….. BUT MAN… they have got to start winning. Please. Make the changes that are necessary to compete. Or people like myself and plenty of others who read, post, donate, etc to places like PSP… will stop going. Then you have real trouble. Matt, as a physician, I must commend you for your attention to this serious local public health problem. And after the pathetic performance of tonight’s match with the Crew… I think I’m going cold turkey.